Native Ads for direct-sold native ad inventory is available to all Google Ad Manager publishers. The use of this feature with programmatic native ads, however, is currently in a limited beta release. If you're interested in participating, reach out to your account manager. When a native ad loads, your app will receive a native ad object via one of the GADAdLoaderDelegate protocol messages. Your app is then responsible for displaying the ad (though it doesn't necessarily have to do so immediately). To make displaying system-defined ad formats easier, the SDK offers some useful resources. For the GADUnifiedNativeAd, there is a corresponding "ad view" class: GADUnifiedNativeAdView. This ad view class is a UIView that publishers should use to display the ad. A single GADUnifiedNativeAdView, for example, can display a single instance of a GADUnifiedNativeAd. 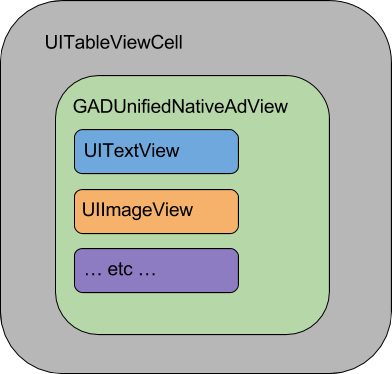 Each of the UIView objects used to display that ad's assets should be subviews of that GADUnifiedNativeAdView object. Recording impressions (when the first pixel is visible on the screen). For indirect native ads (delivered via Ad Manager backfill or through Ad Exchange or AdSense), an AdChoices overlay is added by the SDK. Please leave space in your preferred corner of your native ad view for the automatically inserted AdChoices logo. Also, make sure the AdChoices overlay is placed on content that allows the icon to be easily seen. For more information on the overlay's appearance and function, see the programmatic native ads implementation guidelines. When displaying programmatic native ads, you must display an ad attribution to denote that the view is an advertisement. See this page for the policy guidelines. Let's take a look at how to display native ads using views loaded dynamically from xib files. This can be a very useful approach when using GADAdLoaders configured to request multiple formats. GADUnifiedNativeAdView. This is the ad view class that is used to display a GADUnifiedNativeAd. You'll also need to set the custom class for the GADMediaView, which is used to display the video or image for the ad. In the outlet panel, the outlets in GADUnifiedNativeAdView have been linked to the UIViews laid out in the Interface Builder. This lets the SDK know which UIView displays which asset. It's also important to remember that these outlets represent the views that are clickable in the ad. // Create and place ad in view hierarchy. // required to make the ad clickable. // Populate the native ad view with the native ad assets. // The headline is guaranteed to be present in every native ad. // showing or hiding them. Note: As you can see, the code example above disables user interaction for the UIButton that displays the call to action. If you use UIButtons to display native ad assets, you also need to disable their user interaction so that the Google Mobile Ads SDK can properly receive and process UI events. Because of this extra step, it's frequently best to avoid UIButtons entirely and use UILabel and UIImageView instead. Our GitHub repository has the complete implementations for native custom rendering ads written in both Swift and Objective-C.
Key Point: You are required to use the GADMediaView asset instead of the UIImageView asset if you want to include a main image asset in the layout for your native ad. Image and video assets are displayed to users via GADMediaView. This is a UIView that can be defined in a xib file or constructed dynamically. It should be placed within the view hierarchy of a GADNativeAdView, as with any other asset view. As with all asset views, the media view needs to have its content populated. This is set using the mediaContent property on GADMediaView. The mediaContent property of GADUnifiedNativeAd contains media content that can be passed to a GADMediaView. Ensure that in your interface builder file for your native ad view that you have the views custom class set to GADMediaView and you have connected it to the mediaView outlet. The GADMediaView class respects the UIView contentMode property when displaying images. If you want to change how an image is scaled in the GADMediaView, set the corresponding UIViewContentMode on the contentMode property of the GADMediaView to achieve this. If a video asset is available, it's buffered and starts playing inside the GADMediaView. You can tell if a video asset is available by checking hasVideoContent. If the ad does not contain a video asset, the first image asset is downloaded and placed inside the GADMediaView instead. This represents the aspect ratio (width/height) of the video (if available) or image, or 0 (zero) if no media content is available. By default, mainImage is the first downloaded image asset. If disableImageLoading is used, mainImage is nil and you should set this property to your manually downloaded image. Note that this image will be used only when there is no video asset available. In addition to images, text, and numbers, some native ads contain video assets. Not every ad will have one and apps are not required to display videos when they're included with an ad. The GADVideoController class is used to control video playback and retrieve video playback callbacks. This property is never nil, even when the ad doesn't contain a video asset. Apps can also set a GADVideoControllerDelegate for the GADVideoController to be notified of events in the lifecycle of a video asset. GADVideoControllerDelegate offers a single optional message, videoControllerDidEndVideoPlayback, which is sent when a video completes playback. // Here apps can take action knowing video playback is finished. // This is handy for things like unmuting audio, and so on. Read the Native ads policies and guidelines for more guidance on how to render your native ads.